In the late 1990s, Kenny Cloyd bought a very large boat. It was partly the fruit of many years of hard work, sweat, and tears as he and his partners built California Truss Company from the ground up. It was also a very shrewd business investment. Kenny loved the ocean, and he loved to fish off the coasts of Southern California and Baja Mexico. If you talk to anyone who knew Kenny well, or ever did business with him, they’d describe him as a passionate guy. He never did anything halfway, and he didn’t let anyone around him get away with it either. For those of us who had the pleasure of being swept up in his enthusiasm for trusses, and co-opted into his efforts to grow this industry’s share of the framing market to 100 percent, his death is a tragic loss. Kenny will be remembered for his zeal, his good humor, and, probably most of all, his efforts to constantly innovate within the industry he loved so much. Kenny’s strong work ethic started at an early age and carried on to the day he died. He didn’t graduate from high school, but his understanding of the truss industry, and all it offered to building construction, was matched by few. Though his passion for trusses never flagged, the severity and longevity of the great recession took a toll on him. Even so, his commitment to his employees and his customers ensured that his legacy will continue on through California TrusFrame and Smart Components. One of his first jobs was assisting a door-to-door Singer sewing machine salesman. He’d lug the machines from neighborhood to neighborhood and learned the art of sales along the way. In 1968, Kenny took a job with Simpson Strong-Tie and quickly worked his way up to plant manager. He helped start the residential truss division in 1970 and worked on new product development. While at Simpson, his duties ranged from production studies and full-scale testing to securing building department approvals. He was also put in charge of purchasing equipment and determining the layout for a new production facility. He left Simpson in 1976 to take a job as the commercial/industrial sales manager for Dixieline Lumber’s truss division. His primary responsibility was to create a new market in Southern California for the commercial and industrial application of metal-plate connected trusses and associated wood framing. He parlayed that position into becoming truss sales manager for Timber Tech in 1980. When Timber Tech was purchased by Redman Industries the next year, Kenny got together with a few of his friends and they started their own company. It was a pretty informal operation in those early years. “There are pictures of those guys working hard out in the hot sun with nothing on but shorts, a tool belt, and flip flops,” says Barbara. The sales meetings may have been in the air conditioning, but they were loose as well. “Sometimes our sales meetings consisted of sitting around Kenny’s desk eating corn nuts and Slim Jims and drinking Coors Light,” says Steve. In 1991, Kenny’s life was changed by a forklift. He reached out to a local company to rent a new forklift and Barbara happened to be the leasing agent. While signing the leasing documents, the ever-gregarious Kenny asked Barbara a lot of questions about her work and what she was interested in accomplishing. “He started sharing ideas with me about other companies he knew that I should approach about leasing equipment. He even offered to invite a few to dinner that evening, if I wanted to come and meet them,” remembers Barbara. She pulled her leasing brochures and rate sheets together and met Kenny at the restaurant, only to find he was the only one there. Over dinner she forgave him the ploy as she realized they had a lot in common. Six years later they got married. During that same time period, a major housing slump hit Southern California. To keep the doors open, California Truss Company began building anything the customer needed, including wooden mailboxes. If it weren’t for Kenny’s passion for trusses, they might have become the country’s largest mailbox supplier. In 1995 (with the housing market roaring back), Kenny restructured management, purchased adjacent land to grow the facility to over 20 acres and increased production capabilities. By 2006, California Truss Company grew to do over $35 million in annual sales. Kenny’s fun-loving humor was prominent as California Truss Company grew and prospered. Whether it was during the frequent boating trips, employee-appreciation barbeques or SBCA board meetings, his stories, jokes, and laughter made the mood of the place he was in brighter and more alive. He good-naturedly demanded more from his fellow component manufacturers during association meetings. He challenged them to not be satisfied with where they were but to find ways to innovate further and expand the use of components. It also meant that California Truss Company stayed in business. In 2011, with the worst of the recession behind them, one of Kenny’s main competitors paid him a visit. John Hannah with TrusFrame came with a proposition: Since they were the last two standing, instead of beating up on each other, why don’t they join forces. “Kenny had given all he had to get through the recession,” says Barbara. “He still loved the truss industry, but he was out of steam.” Kenny was relieved his employees had made it through and still had a job, and he was attracted to the idea of retiring and leaving the company in a good position. Later that year, Kenny’s company merged with Hannah’s company. They also acquired the operations of MC Truss in Fresno and Builder’s Choice in Modesto. Combined, the newly formed California TrusFrame (CTF) was able to service the entire California market and produce over $100 million in annual sales. Kenny not only drove his fellow CMs to do more, he continually sought opportunities to expand the market for products he could sell. Through the recession, Kenny started selling into the multi-family and light-commercial markets. 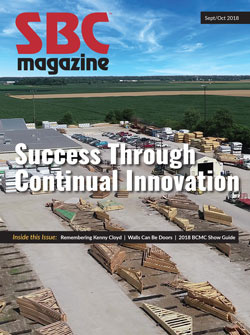 In an interview from 2014, Kenny said, “We started by asking ourselves what our customer really needed, and the obvious answer was enabling them to build faster…Roof trusses were a mature market, so we started looking at walls as a possibility.” Enter Smart Components. The Smart Component concept was a way to use traditional wood truss materials to meet code requirements for lateral and gravity load resistance, while also allowing builders to utilize other performance-enhancing sheathing materials (such as those with improved energy efficiency, water-resistive barriers, etc.) and have larger openings. All of these benefits made Smart Components very attractive to multi-family builders in the Southern California market, where podium slab buildings were starting to take off. To Kenny, Smart Components were a natural extension for his business. In that same interview, he pointed out that they helped him sell traditional wall panels and floor and roof trusses for entire projects. “They were just the tip of the iceberg,” he said. Kenny left behind his wife Barbara, six children and ten grandchildren. He left behind many friends and peers who had served with him (and been mentored by him) during his 20 years as a member of the SBCA board of directors. He also left behind one of the largest component manufacturing operations in the country, operated by hundreds of employees who loved and respected him for all he did to ensure they had a good place to work. His passion for the truss industry was infectious, and his ideas for further innovation live on in all those who worked alongside him. About the Author: Sean Shields tracks market trends and highlights opportunities for component manufacturers to improve and grow their businesses.